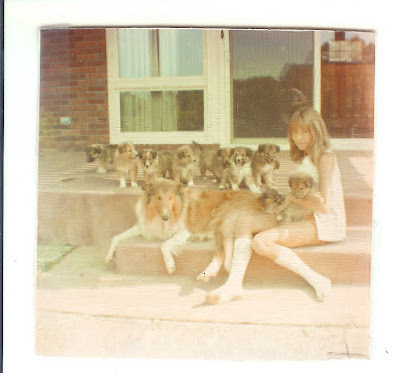 Here is Cris with her Collie, Lassie with her second litter of puppies. What a job they were to handle and feed without getting your legs all scratched up as they reached for the food bowls. Then we built a makeshift pen for them in the yard and they would all be gone the next morning. So every morning for a long time we had to search the woods and the lake around us. They were all sold to good homes thank heaven. They were so very cute though with their sticky bellies. Gosh, it's hard to remember being so skinny. Reminds me of Laura at that age. That was like a dream to me, having all those wup wups to play with that summer. Remember me dressing them in baby clothes. I was a really goofy 13 year old! Yes, I should get that video of the puppies dressed up and put it on a DVD and put it on youtube.